On Tues­day, 24th, I received a call from the Balama Doc­tor, say­ing he urgently needed baby for­mula, as the hos­pi­tal had none. 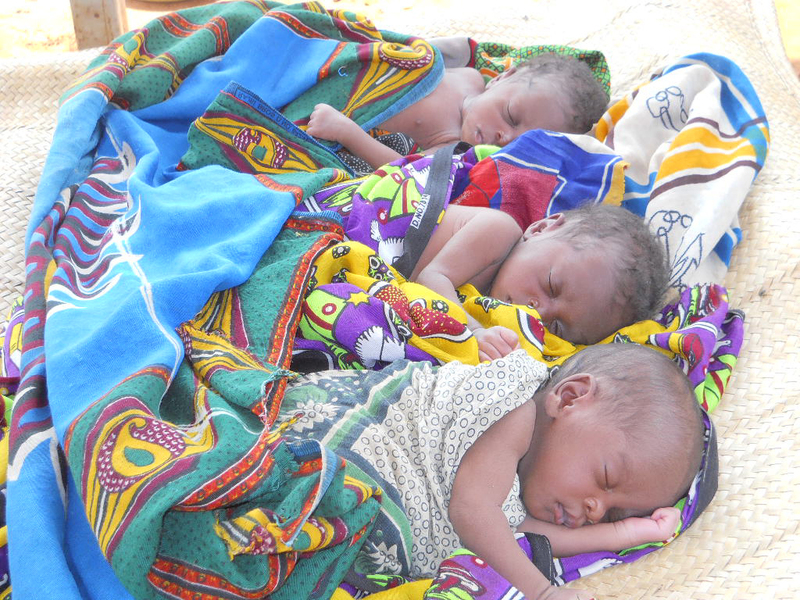 I had no idea until I took it to him, that a mother had come in from 15 miles away car­ry­ing 12 day old TRIPLET GIRLS, each weigh­ing 4.4 lbs. The uncle had brought her in on the back of his bicy­cle, for the hus­band seemed unin­ter­ested in help­ing. The mother’s breast milk was min­i­mal due to her mal­nour­ished state. I imme­di­ately offered our only avail­able widow’s house for her to live in, as the Doc­tor told her these cute lit­tle girls have lit­tle chance of sur­vival unless she stays in Balama town where for­mula and med­ical help are avail­able. 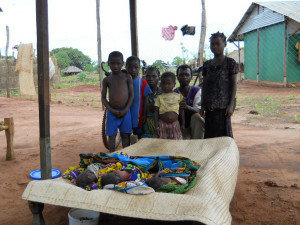 She stated she has 4 other small chil­dren at home, with 2 of them being twins. We explained that the whole fam­ily can come and stay for up to a year, to get these lit­tle ones strong and healthy. Her mother, uncle, and 2 other rel­a­tives arrived, and agreed she needed to stay, but she feared the wrath of her hus­band if she left with­out his per­mis­sion. We took her whole fam­ily back to her vil­lage in one of our trucks to present the idea to the hus­band, but he could not be found. She agreed to send a mes­sage to us on Thurs­day, as we told her we’d return for her fam­ily if he agreed to let her come. On Thurs­day, late after­noon, the mes­sage was that he had never returned to the house, and she was still afraid to leave. I made the deci­sion to send sup­plies to her on Fri­day, 27th, know­ing her milk for­mula would soon run out. Five miles out of Balama, our truck was met by a heavy rains, drop­ping 1.5 inches in next 2 hours. On slip­pery clay roads, the only thing you can do is find a flat spot and SIT till the rains stop. Oth­er­wise, the truck could eas­ily slip off the nar­row, sin­gle lane road into a ditch of fast run­ning water. The road to the triplets vil­lage was now flooded and unsafe for travel. Our truck had to return with­out vis­it­ing this family. Sat­ur­day, the sun peaked it’s head out so I dis­patched Manuel, my best off road dri­ver; Dominica, our Women’s Pas­tor, and a guard in our 4 wheel drive Land Cruiser to take sup­plies to this mother and see if she would come with us. I was SUPER RELIEVED when Manuel called say­ing she wants to return with our truck. LOCAL GOVERNMENT OFFICIALS and her fam­ily stated they would deal with the hus­band when he returned, and she was to go with our staff for the safety of the babies. Before they could leave, the hus­band showed up, and agreed to come with them to Balama to see where they would be stay­ing. He had been with his “2nd wife” for 5 days, so he got an ear full from me and Social Ser­vices when he arrived in Balama about respon­si­bil­i­ties of being a good father. Any­way, what is impor­tant is that the babies are safe, along with her 7 year old twin boys, and girls 10 and 3years old. I don’t have all their names as it has been a very hec­tic day get­ting them set­tled, but I did get photos!!!! Just 1 hour after this fam­ily arrived, I was called to rush baby Jorgina to the hos­pi­tal (Baby Jorgina and fam­ily are next door neigh­bors to the triplets). Baby Jorgina was vom­it­ing, hav­ing dysen­tery, along with a very high fever and rapid res­pi­ra­tions. The Doc­tor met me at the emer­gency room, and we spent an hour sta­bi­liz­ing her for dehy­dra­tion and pneu­mo­nia. PTL the hos­pi­tal just received a ship­ment of med­i­cines, so they are back in busi­ness. With a baby in the hos­pi­tal, you must have 2 moth­ers to sit with her at all times (so one can take a break), as well as bring all your own food and sup­plies. It’s quite a job to orga­nize all this and get them set­tled into their hos­pi­tal room. While at the hos­pi­tal, the staff told me that they were out of food for the patients. The doc­tor con­firmed this when I asked, so back to the barns I went to fetch corn , beans, and fire­wood, as the patients had noth­ing to eat. The Doc­tor was too shy to ask, so I told him when that food ran out, CALL ME and I’ll bring more. He was quite taken by sur­prise when I stated: “Help­ing those in need is one of the rea­sons Jesus sent me here”. THAT got his atten­tion, and I could see him think­ing about it, so I was thrilled. It’s now 3pm, Sat­ur­day, and all is finally calm around here. I can’t tell you how happy we are that these triplet girls are finally safe in our care. With­out our for­mula and intense assis­tance and train­ing, these tiny bun­dles of joy would not make it to 30 days of age. Thank you to my many friends on Face­book who fol­lowed my daily post­ings and prayed for these triplets all week. When an event as intense as this one hap­pens, I will post it on both my Brenda Sue Lange and the Orphans Unlim­ited Face­book pages. If you’d like to get these post­ings via one of these FB pages, please send me a friend request. We were super blessed when an e-mail arrived a week ago stat­ing that our prayers for a play­ground had been answered by the won­der­fully gen­er­ous employ­ees of ICM in Wichita, Kansas. Each year these men and women give their boss, Dave, a “gift” by donat­ing to one of his favourite char­i­ties. We have been super blessed by this gift, and wasted no time get­ting started on the plat­form that will sup­port a slide and 4 swings. All this must be hand­made from con­crete as much as pos­si­ble, as the ter­mites try to rule our area. Any­thing made of wood that goes into the ground will be totally con­sumed within a year. Eric will help us put on the fin­ish­ing touches for the swing mounts and the see saw when he returns from RSA in early Jan­u­ary. 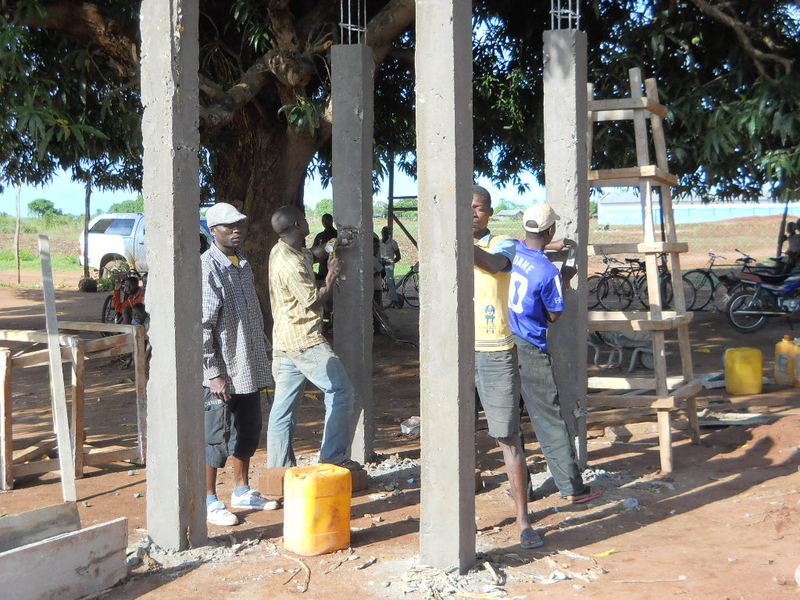 In the mean­time, our con­struc­tion crew is dodg­ing rain storms while build­ing the main sup­port pillars. This con­struc­tion crew is hav­ing a great time work­ing between rain storms. P.S. Was a good thing we had our Christ­mas party last week, as it poured on Christ­mas Day, mak­ing any kind of out­door activ­ity impossible. DODGING RAIN STORMS AS THE CHILDREN’S PARTY MUST GO ON! To put on a party here, you have to go “the extra mile”, since noth­ing comes pre-packaged. You want meat, you buy it on the hoof and butcher the morn­ing of the party. You want rice, you have to orga­nize some­one 1 DAY in advance to “de-hull” the rice by pound­ing the sun dried hulls in a “pil­lar” (pee-larh) which is a large mor­tar made from a tree truck. So my day started at 3a.m., wak­ing up to a pounded rain storm on my tin roof. With a lot of prayer, Praise the Lord!, it stopped at 3:30a.m. So I jump into my King Cab, tak­ing one of my night guards with, to fetch our hon­oured goat at our goat barn 3 miles up the road. Three men unloaded our “guest” at the Children’s Cen­ter, while I dis­tracted our 2 guard dogs (who wanted a goat break­fast). Back at my house, my guards helped me load the 2 HUGE cook­ing pans, 100 lbs of rice, and all the trim­mings into my truck so I could carry them to the cooks at the Children’s Center. 7a.m. rolls around and I think I can grab my “break­fast on a bun” when here comes more work­ers need­ing sup­plies. (orga­ni­za­tion is not their strong point). FYI: Break­fast is peanut but­ter with a touch of honey on a freshly baked roll from one of the local baker’s ovens. They bake bread daily in a REAL PIZZA OVEN WITH A WOOD FIRE. It’s totally mouth water­ing deli­cious when still warm. 7:30a.m. Car­l­i­tos Jorge, our Youth Pas­tor and my best “goat buyer” calls say­ing he’s located 2 goats for a good price, and he needs some­one to trans­port them to our goat barns. Got that organized. Finally get break­fast at 8a.m. (nor­mal time, but remem­ber, I’ve been hus­tling since 3a.m.) so am VERY hun­gry and get­ting a bit cranky. The chil­dren have just arrived at the Cen­ter and begin play­ing games. 8:30a.m. 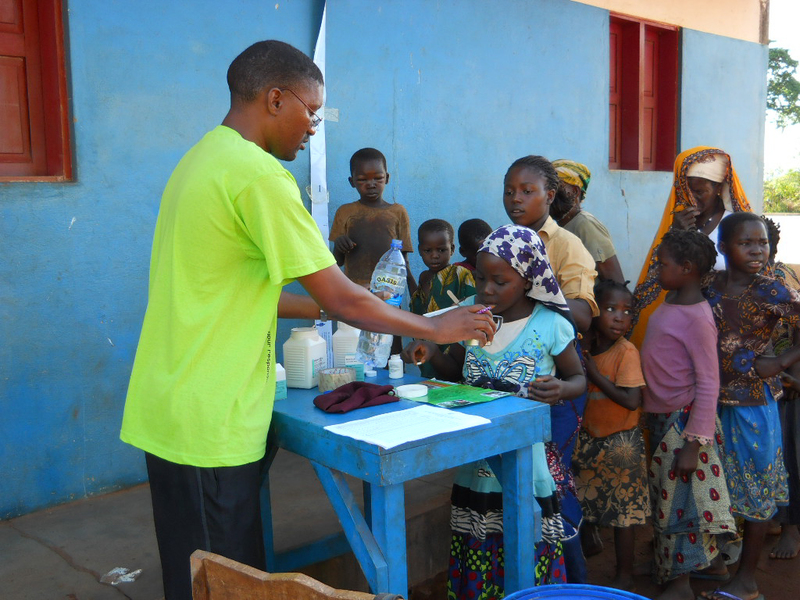 Kiddy Clinic starts: A mother brings her child to me whose vom­it­ing and has a high fever, which is how malaria presents around here. (The Hos­pi­tal is once again OUT of med­i­cines entirely, so I treat this lit­tle boy or he is doomed.) He lost his first pills, so had to give him a sup­pos­i­tory before he could keep things down. Then took him and his Mom home, as he was too sleepy to walk the 500 yards/meters). TRIPLET BOYS hav­ing a great time feast­ing at the party. 9:30 a.m. FINALLY I get to the children’s feast in time to play a few games, take a few pho­tos, and pass out the Christ­mas treats (cook­ies and candy). Rain storm hits, caus­ing every­one to scram­ble for cover, but thank­fully, we have a HUGE class­room for the party MUST GO ON! Yippee! 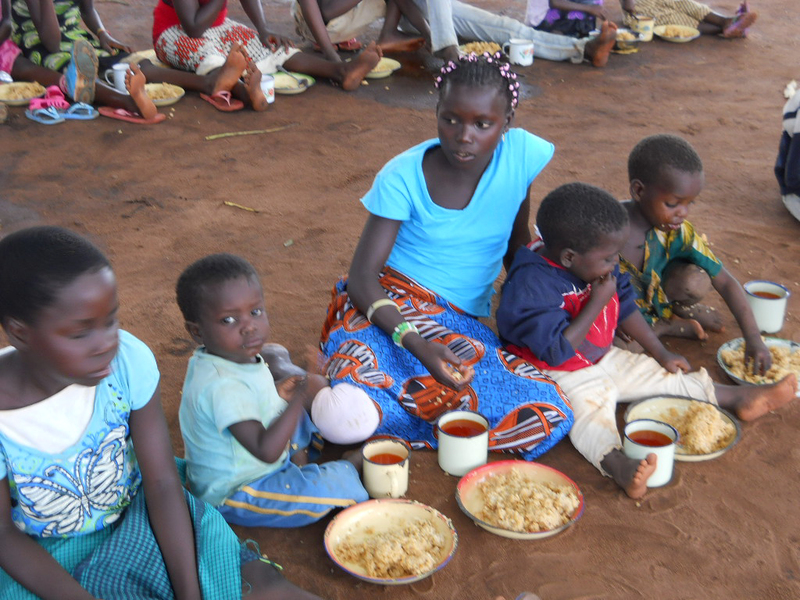 All 80 orphans show­ing off their cook­ies and candy and say­ing MERRY CHRISTMAS AND THANK YOU to our donors. They shouted it so loud, it hurts the ear drums. The kids had a blast, as you can see from the pho­tos. All are super thrilled with the Cook­ies and Candy they received. If you are won­der­ing why no toys, it’s because they are hard to find and very expen­sive when you do find them. ($60 is a nor­mal price for a small beach set of buck­ets, shov­els, and a few plas­tic sand moulds.) This some­thing you’d get for $10 at Wally World. 11:30a.m. Our lit­tle Mon­ica gets sick as the party is end­ing (spe­cial needs 3 year old born with an enlarged heart). I took her and her Mom to the hos­pi­tal, found the Dr. and got her diag­nosed (upper res­pi­ra­tory infec­tion). He told me what to give from my med­i­cines, since the hos­pi­tal had noth­ing to offer. Good thing I keep a good stock of meds, thanks to those of you who give towards this need, and I’m very grate­ful that the Dr. works well with me. Did you know you can make cough syrup from SLICED ONIONS and SUGAR? New one on me. Doc told me how to make it. Learn some­thing new each day. FINALLY got lunch at 1:45pm. (2 fried duck eggs that I chopped up and put into the dish of locally grown rice our cook had made for me). BIG RAIN STORM HITS and I’m thrilled! Cause it gives me a short time of PEACE! My day finally slows down so that I can write a few e-mails! 4pm. Time to wrap up my day by feed­ing the guard dogs, make a quick sup­per, and fetch my sun tea and solar shower bag from the “solar table”. That about wraps up my “party day”. Pic­ture me: Bunny with ears droop­ing, and shoul­ders slumped for­ward, drag­ging her­self in for a shower and a bed. Now you know why God made Moms with the abil­ity to multi-task. I couldn’t do this job with­out HIS GRACE in that area of my life! Most of you “Moms” out there know exactly how this feels. Dr. Fumo, (means Dr. Smoke). He’s a great guy with a BIG HEART for th kids. Feed­ing kids and not worms is my well known motto around here. Is great to have a lit­tle help from the local hospital. My friends, I hope you all have a won­der­ful fam­ily Christ­mas and spend some time thank­ing our SAVIOR, JESUS for all He has blessed you with this year. 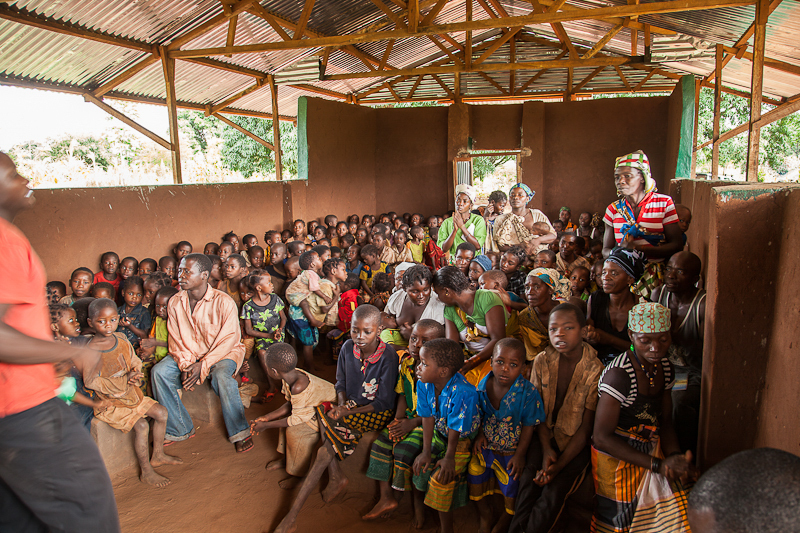 Our chil­dren pray for you and send their THANKS for all you’ve done to help them this year. ORPHANS UNLIMITED, OPERATION RESCUE, 2014 DVD NOW ON LINE! Our Christ­mas present from our chil­dren to all of you! Eric worked very hard yes­ter­day after church to com­plete this 4 minute DVD, so he could send it to the USA for every­one to see what our chil­dren accom­plished this year. Our chil­dren are grow­ing up and lead­ing the way in the evan­ge­lism depart­ment. Each week they bring new friends, and in turn those friends bring oth­ers so that they too can know Jesus! 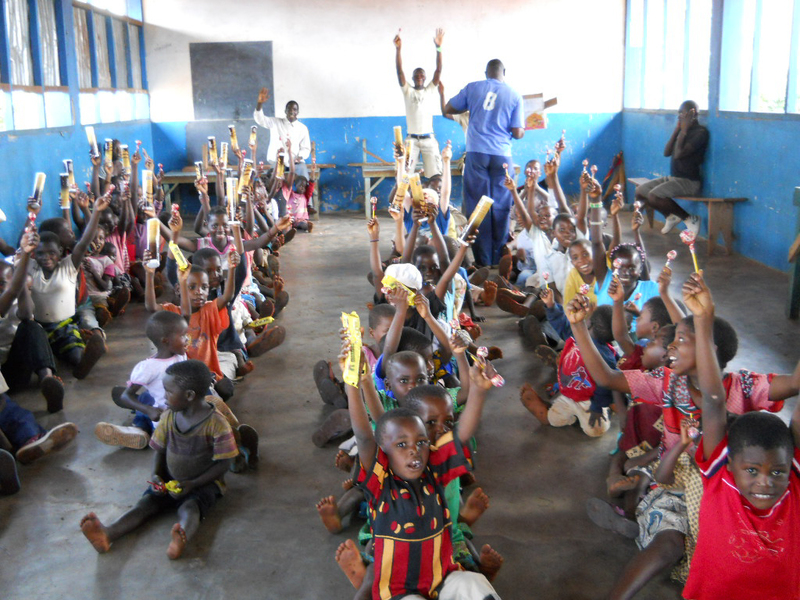 All 19 of our Balama Sun­day Schools are grow­ing at a fast rate, with num­bers rang­ing from 50 to 140/church/week. Yes­ter­day it was heart-warming to see over 100 chil­dren in the Balama Sun­day School, ages 4 years to teenagers, GO DOWN ON THEIR KNEES TO PRAY the “Prayer of Sal­va­tion” with their friends. ALL THE CHILDREN repeated the Prayer of Sal­va­tion together, so that those who were doing it for the first time wouldn’t feel so ner­vous! It brought tears to my eyes as this is the first time they have done this! It was so beau­ti­ful to see “the fruit of love” flow­ing from their hearts. The DVD is now on our web­site marked OPERATION RESCUE, 2014. The chil­dren asked me to send you a MERRY CHRISTMAS! They shouted it in Sun­day School yes­ter­day, and it was so loud, I was cer­tain some of you must have heard them. TOGETHER, WE ARE TRULY CHANGING THE WORLD, ONE CHILD AT A TIME. THANK YOU FOR MAKING THIS PROGRAM POSSIBLE. WITHOUT JESUS, WE HAVE NO HOPE, AND WITHOUT HOPE, THERE IS NO PURPOSE TO LIFE. JESUS IS THE LIGHT OF OUR LIVES, AND THE REASON FOR THIS SEASON! Please share HIS LOVE and HIS MESSAGE OF SALVATION with all those who cross your path. It’s the best gift you can give those who touch your life. MERRY CHRISTMAS TO ALL OF YOU! BUSH BUNNY BRENDA ERIC DRY BALAMA STAFF AND “THE MANY CHILDREN” God has entrusted us with. First, let me say that I’ve just returned from an overnight Christ­mas sea­son “break” thanks to a Texas friend who gave me a per­sonal gift of a mas­sage and a spe­cial meal (to be redeemed in Pemba). My spe­cial meal was a HUGE Cheese Burger with fries and salad. You may think that isn’t spe­cial, but in a coun­try where BEEF is not an easy to get meat, believe me, it is spe­cial! Next time you buy a burger, remem­ber that here it costs $14 for a real beef burger with cheese. I enjoyed it immensely! 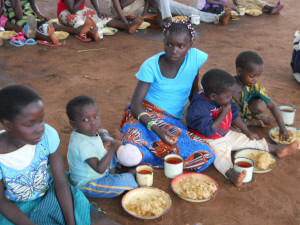 Eric is leav­ing on Mon­day for his hol­i­day break with his grand­kids, so this last Friday/Saturday was my only chance to “get away” before we gear up for the Orphan’s Christ­mas Party on Wed. Thurs­day we dis­trib­ute food that will last over 300 orphans and wid­ows for 2 weeks. (so all staff can take a Christ­mas break). Fri­day, we will pay Decem­ber salaries so that all our work­ers can orga­nize Christ­mas with their families. I had a relax­ing 36 hours and am now back in Balama, ready to party with my children! Tues­day this week found my staff, 12 of our pri­mary school orphans, and 5 of our Bush Pas­tors at our AWANA court and classroom. I thought it totally appro­pri­ate that our chil­dren teach the 7 basic AWANA games to the Bush Pas­tors, for who knows them bet­ter than they do? 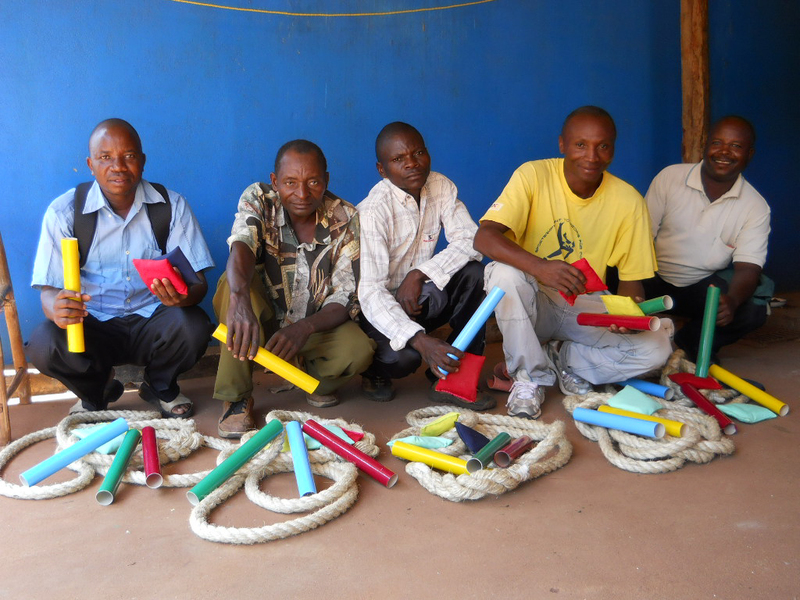 In 2014, we plan to help all 19 of our pas­tors learn how to use the AWANA cur­ricu­lum so their vil­lage chil­dren can learn the Bible from Gen­e­sis to Rev­e­la­tions. 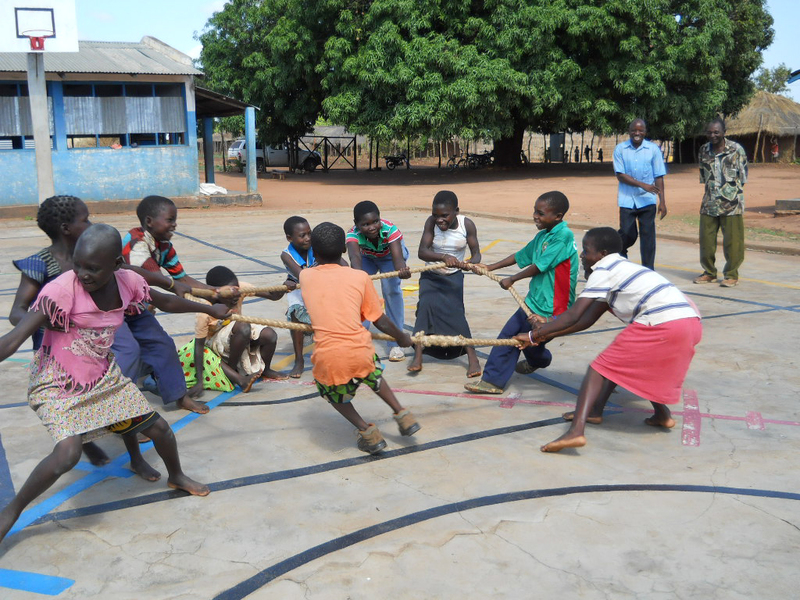 These games are a fan­tas­tic mag­net that draws chil­dren of all ages to Jesus. 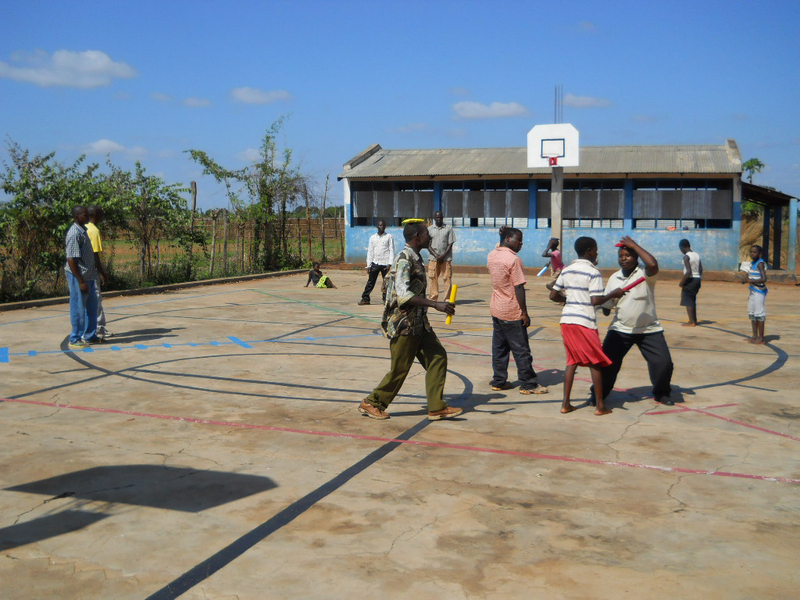 These 5 churches were the first to com­ply with the need for a dirt “games court”. None of them can afford a fancy con­crete court on which to play the AWANA games, but they “made a plan”. They cleared a level piece of land and will use ASH from their fire pits to mark the court on AWANA club days. After the games train­ing was com­pleted, we met in our class­room, giv­ing the Pas­tors their first month’s lessons in Por­tuguese and teach­ing them how to run a club. They will begin in Jan­u­ary. After­wards, they were given their AWANA game mate­ri­als ( a tug-o-war rope, 4 col­ored bean bags, and 4 col­ored batons). 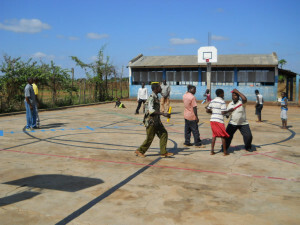 It will be inter­est­ing to see how they han­dle the 100’s of chil­dren who will show up once they hear about the games. We look for­ward to the awe­some reports, for each of these churches have 80–140 chil­dren each week in Sun­day school. To han­dle the large num­bers, I rec­om­mended they break it up into proper age groups and hold club meet­ings 3 days a week. Until next week, my friends. Keep those prayers com­ing! All is “quiet” in our area at the moment, and we pray it stays that way. There is still some fight­ing going on south of us. Rains are rolling in as I am hear­ing a con­stant grum­bling of rolling thun­der com­ing my way. Need to get off the com­puter, as light­en­ing likes solar pan­els. More next week! When I drove up to the goat barns Thurs­day, I heard one of the Mommy goats bleat­ing loudly. 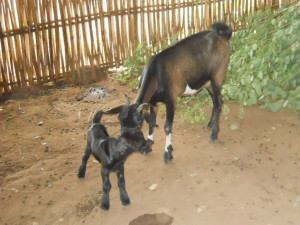 Pas­tor Joaguim told me I was just in time as this goat was about to deliver. Observ­ing from a dis­tance for about 5 min­utes told me some­thing was wrong, as I could see the baby’s front hoofs and nose, but noth­ing moved with the fol­low­ing 2 con­trac­tions. The female began throw­ing her­self against the bam­boo cor­ral fence, obvi­ously in great pain. I had the men catch her while I put on gloves. This wasn’t my first birthing assis­tance, as over the years, I’ve deliv­ered 5 human babies with some being in mud huts and unster­ile con­di­tions, as well as helped horses, cat­tle, cats, dogs, and even baby ducks who were in dis­tress. With some gen­tle assis­tance, and down­ward ten­sion on the legs, this baby began to slide out into my hands. It kept com­ing, and com­ing, till the men began to yell in amaze­ment. I thought WHOA, what have I got here? This solid black “Goliath” of a goat is 1 inch (2.2cm) TALLER and 1 lb. (0.5kg) heav­ier than our other baby goats at birth. I call him JUNIOR, but my men just call him BIG! The photo shows Junior at 24 hours of age, stand­ing with his mother. He’s cute and cud­dle now, but his heavy bone struc­ture tells me he will be a heavy weight for sure when he grows up. 1. Our brick lay­ers put the fin­ish­ing touches on our 3rd Orphan Com­plex on Fri­day. The car­pen­ters and painters are hard at work, as our goal is to get the chil­dren into their new home before Christmas. 2. Eric is putting together our 2014 DVD, as he leaves for South Africa mid­dle of this month. Eric now has 4 grand­chil­dren, who eagerly await his arrival. No wor­ries here, as Bush Bunny is totally com­fort­able being alone for Christ­mas. I’m putting on extra night guards at my house, and my best dri­ver is close by if any­thing hap­pens. Many mis­sion­ar­ies will be stay­ing in Moz. for Christ­mas, so I have friends close by. FAITH NOT FEAR rules my life. 3. We plan a great Christ­mas for our chil­dren, so every­one is busy plan­ning the feast and fun of cel­e­brat­ing Jesus’ birthday. I hope that all of you are hav­ing a won­der­ful time plan­ning how you will cel­e­brate our Saviour’s birth. With­out JESUS, there would be no eter­nal life wait­ing for us at the end of our race.